This brilliant 3-in-1 body sculpting system results in inch loss and younger-looking, tighter skin. Permasculpt utilises Ultrasound, Radio Frequency (Mono and Bi Polar) and Vacuum Suction to create amazing inch loss and body sculpting effects. Distinction guarantees results over a course of 4 treatments, using before and after photographs of you. PermaSculpt removes fatty tissue in 3 ways. Using Ultrasound, fat cells can be destroyed. Using RF, the cells can be shrunk. 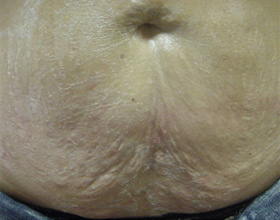 Using Vacuum Lymphatic Drainage, the cells can be broken apart. PermaSculpt's RF module can be used to shuffle collagen closer to the surface while stimulating regeneration of new collagen to make skin appear smoother and feel revitalised. PermaSculpt's RF technology consists of 2 separate RF heads, MonoPolar and BiPolar. 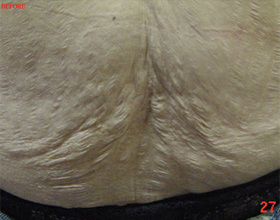 MonoPolar RF allows heat to penetrate deep into subdermal layers causing fat cells to shrink and literally melting fat so it can be excreted from the body. This gives an instant inch loss result. BiPolar RF is aimed at spreading gently through superficial layers. In combination our RF technology allows the practitioner to heat the lower collagen rich layers of the skin, helping tighten existing collagen, bringing collagen to the surface and stimulating the formation of new collagen, leaving skin smoother and tighter. PermaSculpt's Vacuum Lymphatic Drainage system consists of 2 separate size heads. The operation is fully adjustable from long, smooth to short, powerful pulses. The diversity achieved from having adjustable size, pulse and power, gives the practitioner control of the process and the ability to treat a variety of different body sculpting issues. The PermaSculpt VLD can even be used for gentle body massages however, is most commonly known for non surgical cellulite removal & skin tightening, without any consumables, side effects or mess. Distinction are proud to offer a Guarantee with Episoft RF sculpture. Call now for your free consultation to find out more.